Zoho Desk is a context-aware help desk software that helps businesses focus on the customer. It's convenient to use, can be customized to fit any business, and doesn't cost a fortune. Zoho Desk comes from Zoho, the operating system for business. Key features: - Work Modes organize your tickets based on due time or customer type, so you know which ticket needs you first. 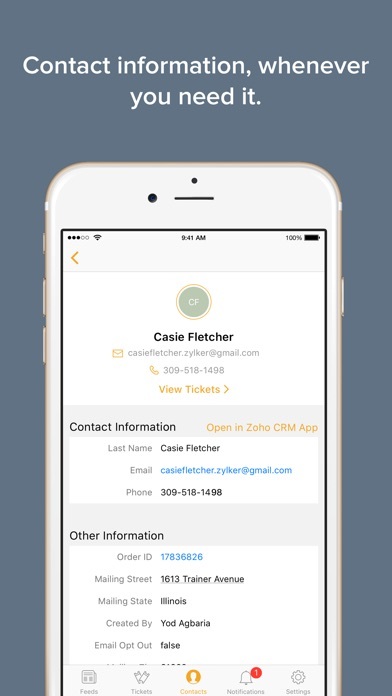 - Zoho Desk brings in customer information from Zoho CRM, so you can put a face to each ticket. 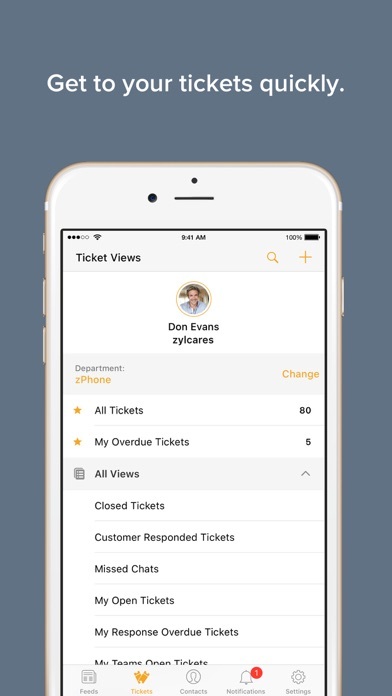 - Tickets are displayed as conversations, so agents can stay updated on ticket activity. 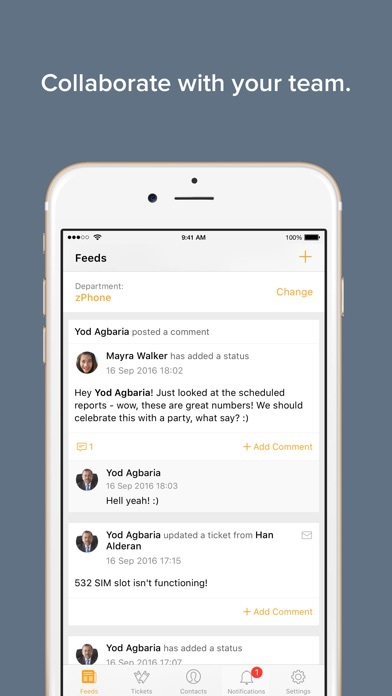 - With the all-new Team Feed, you can tag your team members on tickets, and collaborate to close tickets faster. 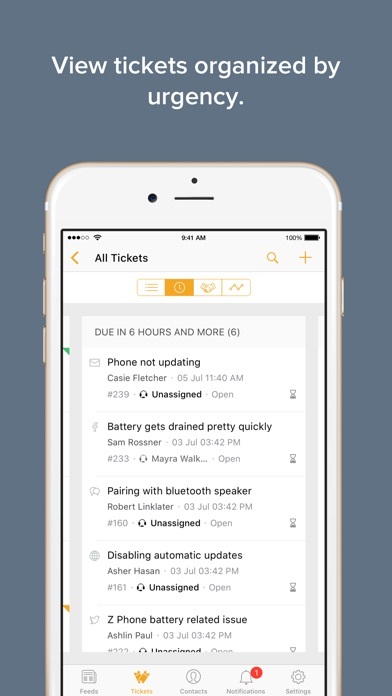 - The Notification Centre brings you updates on your tickets, so you stay on top of things wherever you are. - Perform frequent ticket actions like edit, close and move with quick swipes. - Create, view, edit and delete tickets from any department. - Add and update comments and ticket fields. - Receive push notifications on ticket updates, comments and @mentions. - Re-assign tickets to other team members and pick up unassigned tickets. - Move tickets to other departments. 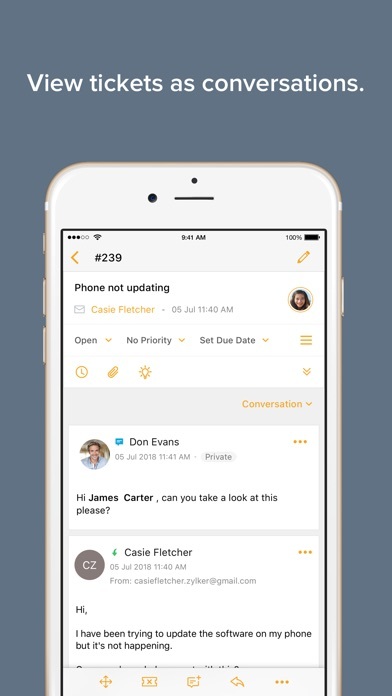 If you need any help with this app, feel free to shoot an email to desk@zohomobile.com. The app doesn’t work half of the time. It freezes and does not update. Very reliable, doesn’t crash. Only downside is it lacks the functionality of turning off the “your ticket has been closed” email when closing a ticket within the app. You need to be on the desktop version. Would also be nice to have a swipe to delete option rather than having to go into each message. App crashes when ticket is opened which has embedded image. Latest update didn’t fix it. App works fine on iPhone X. However, when I open the ticket that has attachment of picture, app crashes right away. If this is fixed, app works just great ! The app works well...it is missing task options though so please add this function. We're integrating nearly all of the Zoho solutions into our existing operations. We couldn't be more pleased - and don't shy away from it because it seems like a lot of apps to install... because it's NOT. Each one is simple to understand and any questions we have had, never had a chance to become "issues" that "fell through the cracks". I'm assuming that the level of communication and support they give is a shining example and endorsement of how their own SYSTEM is working. For some reason I can no longer assign tickets through the app. It says it assigns, but when I refresh it goes back to the unassigned queue. Not sure what is going on here. This app is an affect tool to create and manage service request tickets on your phone or tablet. The nice design allows you to check and update statuses without too many complicated menus. I am using the free Zoho Desk product and I’m happy with what it offers me both via the web and on my phone. I recommend it! Fácil de usar e intuitiva. Muy bien diseñada.